I am fascinated by felting and often resort to it instead of frogging in a bit of an ‘if all else fails’ kind of way. At least I don’t feel that my hours of knitting have been wasted. Unravelling a piece of knitting is so demoralising that I would rather just walk away. 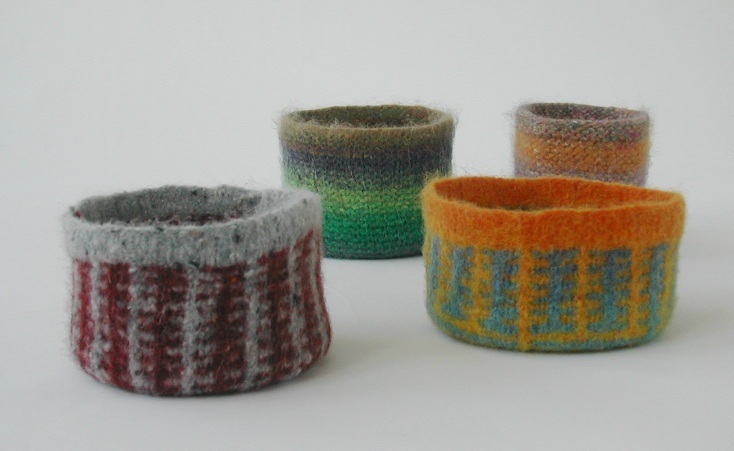 These bowls are part of the latest batch of my journeys through felting. The two in the background are Noro (my guilty pleasure) and are for my DH. He is always fascinated by the interplay of colours in this family of yarns. The two in the foreground were my attempts at a slipped stitch hat for a baby that just didn’t work. On the left is Lang’s Donegal, a lovely soft tweedy yarn. The bowl on the right is knitted in Kauni Effektgarn shade EQ taken from opposite ends of the same ball. I find I get the best results at felting when I put a couple of pairs of jeans in the washing machine and go for a 40 degree wash to start with. As soon as the machine has stopped I whip the bowls out, give them a quick spritz of spray starch and squeeze them over a vase or glass. I then ease or work them into the shape I want and leave them to dry.